Recently, I described how to perform speech recognition on a Raspberry Pi, using the on device sphinxbase / pocketsphinx open source speech recognition toolkit. This approach works reasonably well, but with high accuracy, only for a relatively small dictionary of words. Like the article showed, pocketsphinx works great on a Raspberry Pi to do keyword spotting, for instance to use your voice, to launch an application. General purpose speech recognition however, is still best performed, using one of the prominent web services. Google’s speech recognition and related services used to be accessible and easy to integrate. Recently however, they got much more restrictive and (hard to belief, I know) Microsoft is now the place to start, when looking for decent speech related services. Still, let’s start with Google’s Speech Recognition Service, which requires an FLAC (Free Lossless Audio Codec) encoded voice sound file. 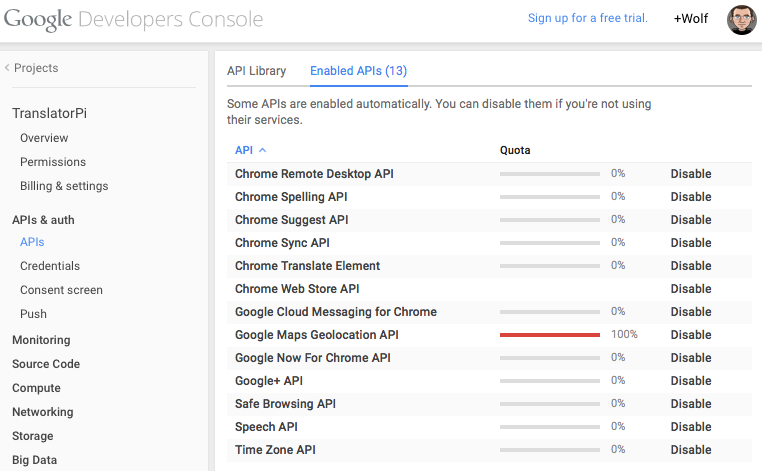 Accessing Google’s speech recognition service requires an API key, available through the Google Developers Console. I followed these instructions for Chromium Developers and while the process is a little involved, even intimidating, it’s manageable. The important part is to create an API Key for public access. On the left side menu, select API & auth / Credentials. Here you can create the API key, a 40 character long alpha numeric string. Back on the Raspberry Pi, there are only a few more libraries needed, additionally to what was installed in the above mentioned on-device recognition project. 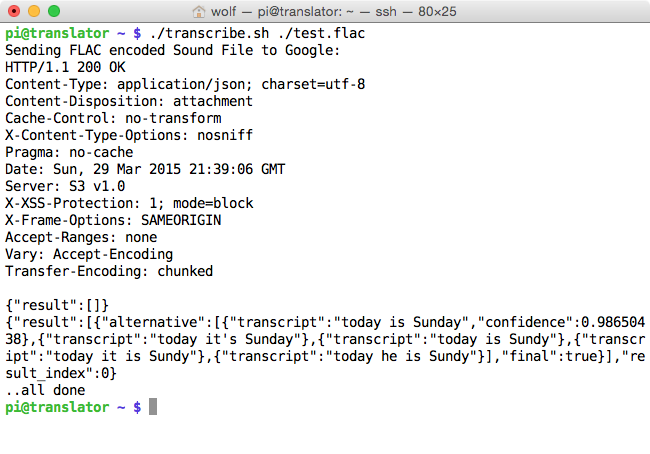 "transcript": "today it is Sundy"
"transcript": "today he is Sundy"
Encoding doesn’t take long and the Google Speech Recognizer is the fastest in the industry, i.e. the transcription is available swiftly and we can send it for translation to yet another web service. Creating an account at the Azure Marketplace is a little easier and the My Data section shows that I have subscribed to the freetranslation service, providing me with 2,000,000 Characters/month. 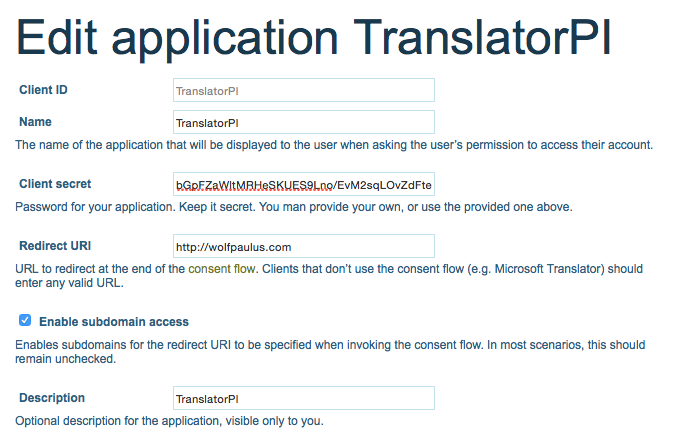 Again, I named my project TranslatorPi. On the ‘Developers‘ page, under ‘Registered Applications‘, take note of the Client ID and Client secret, both are required for the next step. Use Google’s Speech Synthesizer and synthesize the recognized utterance. Use Microsoft’s translation service to translate the transcription into the target language. Use Google’s Speech Synthesizer again, to synthesize the translation in the target language. What would you recommend on this menu? 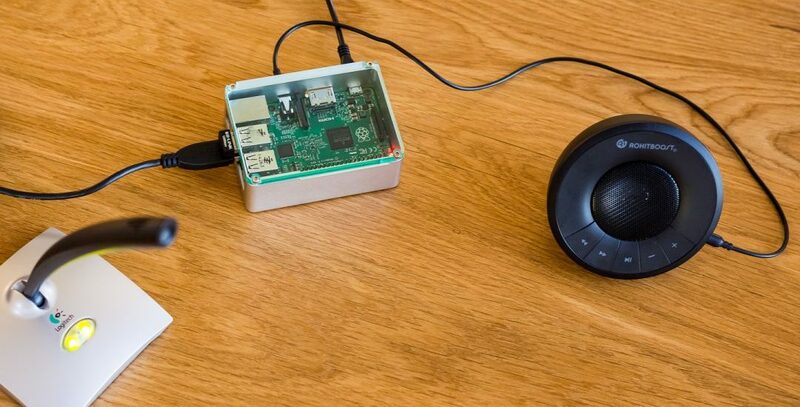 This video shows the Raspberry Pi running the translator, using web services from Google and Microsoft for speech recognition, speech synthesis, and translation. Thanks for this, it helped me write my own python script to connect to the Google Cloud Speech API and then execute a command. It’s a bit like a basic Amazon Echo. Translation: ArgumentException: Invalid appId\u000d\u000aParameter name: appId : ID=0646.V2_Json.Translate.4D9A656E listening .. Please help, thank you kindly. Good work sir, Well post, I just wanna know can I use Arduino instead of Raspberry Pi?